By the way, after nearly three years at Sanlitun Soho, this baijiu bar closed a few days ago and will reopen in a new spot in March or April. Let’s hope the team behind it keeps the present spirit when it comes to the cocktails, glassware and decor! Although we started with the baijiu flight, let’s cover some cocktails and shots first. The Rel-Axl Rose. A light, sweet and smooth cocktail with ‘sauce’ aroma baijiu, Grenadine, rose wine and egg white. 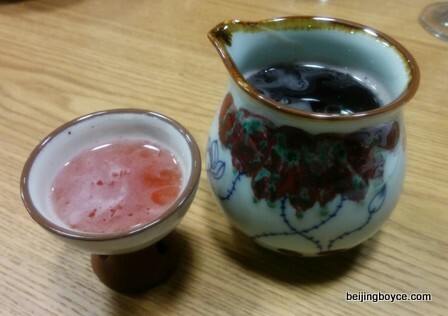 The rose and Grenadine tame the baijiu enough so that it contributes a nice saucy edge. I like the glassware, er, woodware, used here, indicative of the attention to detail at En Vain. Our tasting group generally like this one. Single Lady. A peppy fruity drink with some slight spice and herbal touches due to the alcohols used. 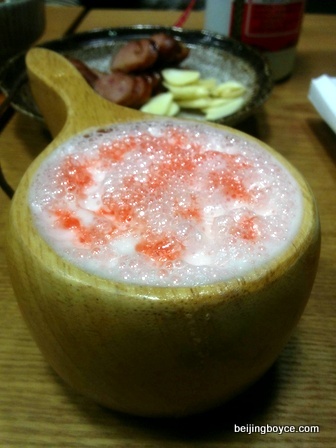 It includes Dongjiu (‘medicine’ aroma baijiu), Cointreau, lime juice, bitters and Sprite. The beaker container makes it easy to share this drink with friends. While not everyone liked this one, it ranked as the favorite with a few people. Jiu’d Fashioned? 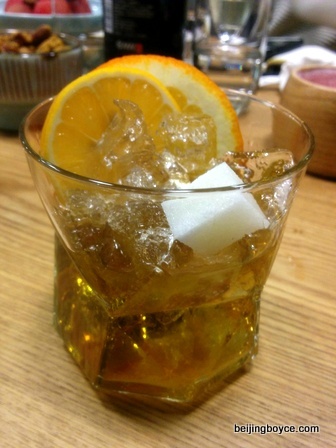 This mix of strong aroma baijiu, whisky, brandy and bitters, plus a sugar cube, is from the upcoming menu and was an eye-opener. (It is currently unnamed: drinks aficionado DT suggested the Old Fashioned take “Jiu’d Fashoned.) While this drink was initially quite dry, DT played with the sugar and citrus levels and it increasingly improved. Nice! En Vain in the Membrane (Yes, I made that name up). Baijiu, creme de menthe and fresh chili pepper might not sound like an ideal mix but the spicy and sweet elements made this a fun shot. If you don’t like spicy stuff, you probably want to stick to the Rel-Axl Rose or Single Lady, because this one packs some heat. Consider it an experimental alternative for the tequila shot. 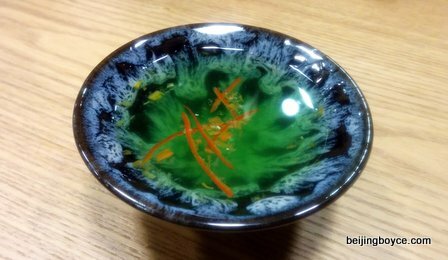 We tried a handful of others, too, from a baijiu-sambuca-fruit concoction to shots that included baijiu and ginger to a drink with pop rocks. It was fun to see so much creativity. Light aroma. This category tends to be less pungent and have a “bit of sweet flavor”, said En Vain co-owner Li Ke. 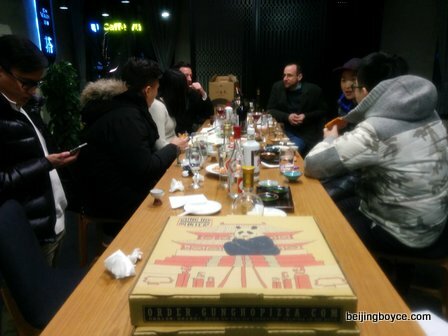 We tried Fenjiu from Shanxi Province, which had a mild and savory aroma. This one was slightly oily, with a touch of sweetness, a mild fruitiness–peach?–and a clean tingly finish that didn’t burn like many baijius I have tasted. I liked this one. Strong aroma. 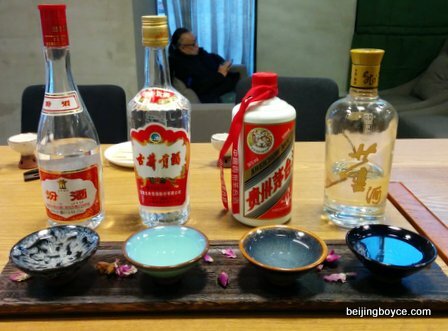 “More fierce, more fruity”, with a stronger smell, is how Li characterized this baijiu category. The aromas included cooked rice, tropical fruit and an ester-y smell that some might describe as a bit like solvent. This one was, as predicted, fiercer. The initial taste is sweet and then things get intense, and slightly sharp, through to a long licorice / anise finish. One taster said “it smells like gas”, another felt it had a bit of a “goat” aroma, and yet another said “it acts like a solvent on my saliva”. Perhaps not the favorite category of the bunch. Sauce aroma. Now we tried what many consider a funkier category, one best-known by the brand Maotai. It smelled like soy sauce plus damp hay plus maybe some sourish fruit. A bit funky. This supple spirit had the fullest ‘mouth feel’ and a long tingly numbing finish. “Cheese, tobacco and green peas” said one taster. “Smells like baby vomit” said another. I found this one to be the most complex and I liked it for the contrast to my other favorite of the four, the cleaner and simpler Fenju. Medicine aroma. The category refers to the use of herbs found in traditional Chinese medicine, said Li. Like the sauce aroma, this one was a bit funky, with herbs and a slight barnyard smell. It had an initial sweetness, and was fairly light but sharp, though it had too much of an ester factor. We also tried a baijiu I brought from Yimuquan, a distillery in Baoding, and this one was well-received given its fairly rich, smooth and slightly viscous body. I’ll have more on that one later. 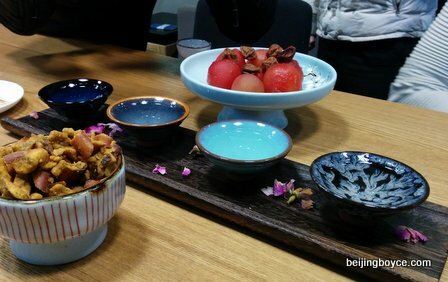 Suffice it to say, we all had a rosy glow by the end of the tasting, a tasting that took baijiu out of its usual “ganbei” realm and showed it has far more versatility than many people think. Thanks to the guys at En Vain for hosting the tasting, and for all the guests for sharing their opinions, and I look forward to trying more creations once the new place opens in a month or two!